Novak Djokovic’s hopes of completing the career Grand Slam and reclaiming the No. 1 Emirates ATP Ranking were put on hold Sunday at Roland Garros, but he received a boost from the outpouring of support he received following his defeat to Rafael Nadal. 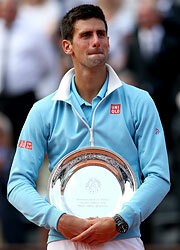 The Parisian crowd rose to its feet and gave the two-time runner-up a lengthy and resounding ovation for his efforts, moving Djokovic to tears. For a third straight year, and for a sixth time in his 10 appearances, Djokovic’s Roland Garros campaign ended with a loss to Nadal. It marked his first defeat to the Mallorcan since the 2013 US Open final. Djokovic had won four straight meetings entering their 42nd FedEx ATP Head2Head clash, including last month in the Internazionali BNL d’Italia final. “I wasn’t playing at the level that I wanted, especially in the second part of the match,” he said. “These kind of big matches obviously take the best out of players, and of course it’s a huge challenge. A five-game run late in the second set, when he limited Djokovic to a mere five points, sparked Nadal’s 3-6, 7-5, 6-2, 6-4 victory on Sunday. Djokovic also lost to the nine-time Roland Garros champion in four sets in the 2012 final, and fell in a 9-7 decisive set in last year’s semi-final. “It’s not impossible, but it’s very, very difficult to stay with Rafa on this court throughout the whole match on the highest level of performance,” said Djokovic. “It’s normal that you have ups and downs. I was just hoping that in the fourth I would be able to come back. I started feeling a little bit better, but I wasn’t managing to bring my A game when it was most needed in the end of the fourth. The 27 year old will next return to action at Wimbledon, where he will look to reclaim the crown he won in 2011 (d. Nadal). Djokovic finished runner-up to Andy Murray last year.